Aquaculture is the fastest growing food production system in the world and one of the key sectors expected to expand under the EU Blue Growth initiative. Today, nearly all global aquaculture is carried out inshore. Competition for space (from multiple sectors) coupled with ecosystem health concerns are obstacles to future growth. Such drivers, at local and global level, incentivise aquaculture to move offshore to the unprotected waters of the open ocean. The NW European Shelf Seas (NWS) are economically, environmentally and culturally important. 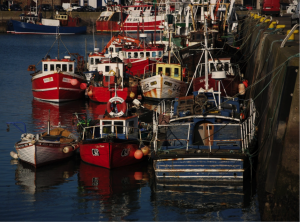 There are statutory obligations to protect and manage the environmental quality of the NWS (Marine Strategic Framework Directive, MFSD) and its fisheries (Common Fisheries Policy, CFP). This requires an idea of the current and recent state of the NWS (monitoring). While observations are vital for this task, they are limited in time and space, and do not provide forecasts. 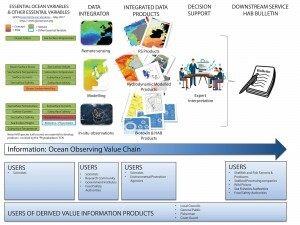 The observation network can be augmented with marine reanalyses, which assimilate observations into numerical models of the NWS, keeping the model close to reality, and providing a complete estimate of the evolving state of the ocean. Improving the Atlantic Observing system through the AtlantOS project is expected to improve these reanalyses on the NWS. Fisheries regulations, as those established by the European Commission need to rely on the best available scientific advice to ensure that fish stock exploitation levels remain sustainable over the long term. 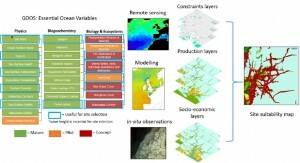 Fish population dynamic models are essential tools used to estimate fishing impact and provide key indicators of exploitation. 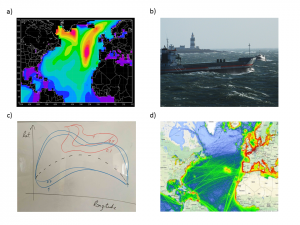 Progress in fish population modelling integrating environmental variables derived from Earth Observation and Operational Oceanography (COPERNICUS CMEMS program http://marine.copernicus.eu/) makes it possible to propose a demonstration of a near real-time forecast of one key tuna stock in the Atlantic Ocean. AtlantOS T8.7 will develop a demonstrator for the albacore tuna to simulate in near real-time the change in abundance over time and space of this species by life stages (larvae, juveniles, adults). 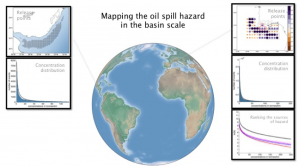 Every year, millions of tons of oil are spilled in the global ocean due to accidental (large and infrequent) spill events and operational events (typically small and frequent) associated with the maritime traffic. Despite the impressive numbers of such events, we still ignore the potential coastal impacts due to oil spill pollution on a global scale limiting our capabilities of managing the hazard. Ocean and shelf seas are pivotal to the future of humankind. Currently oceans provide roughly 20 % of the protein consumed by humans. The world GDP is mainly based on ocean economical aspects. Emerging and developing countries, with a huge need for ocean resources, play an ever-increasing role in defining ocean governance and science. 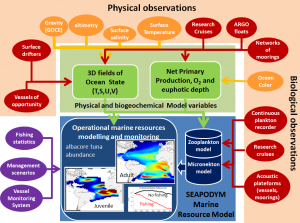 Education founded on a well-managed mix of interests and needs in the field of oceanography and marine science is more imperative than ever in order to secure earths´ future oceans as a sustainable resource. 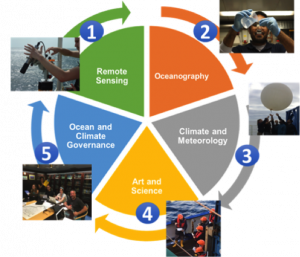 We aim to train ocean experts to address the sustainability of our global ocean, promoting excellence and moral sounding. International shipping contributes with an appreciable share to the global emissions of GHGs (2.2% of them, according to Smith et al. (2014); like Italy and Spain together, according to the Edgar database). Shipping GHG emission responsibility is fully acknowledged by the International Maritime Organization (IMO), which has also recently approved an initial strategy for GHG emission reduction from ships (IMO, 2018). The European Union has approved the inclusion of maritime emissions in the Union’s GHG reduction commitment. This is a three layered process, including: Monitoring, Reporting, and Verification of emissions; definition of reduction targets; and application of Market Based Measures (COM(2013) 479 final). Aquaculture is an important marine food source and has positive impacts on the local economy of rural marine communities. However, as with all businesses, the marine aquaculture sector has challenges. One of the threats to the industry is the occurrence of harmful and potentially toxic phytoplankton – also known as HABs or harmful algal blooms. This is a recognised global problem, with yearly losses to fisheries and shellfisheries running into billions of Euros per annum; conservatively estimated at USA $ 95 million, Europe > € 800 million, Japan US $ 1 billion (Bernard et al. 2014). AtlantOS T8.1 will develop a weekly HAB bulletin for three study areas: Norway, Ireland and Spain.